wait now, light me up so we do this right, yes, hold me steady to the lamp, hold it, hold, good, a slow pull to start with, to draw the smoke low into the lungs, yes, oh my, and another for the nostrils, and a little something sweet for the mouth, and now we can begin at the beginning with the first time at Rashid’s when I stitched the blue smoke from pipe to blood to eye to I and out into the blue world— and now we’re getting to the who of it and I can tell you that I, the I you’re imagining at this moment, a thinking someone who’s writing these words, who’s arranging time in a logical chronological sequence, someone with an overall plan, an engineer- god in the machine, well, that isn’t the I who’s telling this story, that’s the I who’s being told, thinking of my first pipe at Rashid’s, trawling my head for images, a face, a bit of music, or the sound of someone’s voice, trying to remember what it was like, the past, recall it as I would the landscape and light of a foreign country, because that’s what it is, not fiction or dead history but a place you lived in once and cannot return to, which is why I’m trying to remember how it was that I got into trouble in New York and they sent me back to Bombay to get straight, how I found Rashid’s, and how, one afternoon, I took a taxi through roads mined with garbage, with human and animal debris, and the poor, everywhere the poor and deranged stumbled in their rags or stood and stared, and I saw nothing out of the ordinary in their bare feet and air of abandonment, I smoked a pipe and I was sick all day, hearing whispers in my stone sleep about the Pathar Maar, the stone killer, who worked the city at night, whispers that leaked upward from the poor, how he patrolled the working- class suburbs of Sion and Koliwada and killed them while they slept, approached those who slept alone, crept up to them in the night and killed them but no one noticed because his victims were more than poor, they were invisible entities without names or papers or families, and he killed them carefully, a half dozen murdered men and women, pavement people of the north- central suburbs, where the streets are bordered by effluents and sludge and oily green shimmer, and all that year he was an underworld whisper, unknown to the city’s upper classes until he became a headline, and in my delusion I thought I understood his pity and terror, I thought I knew him as a Samaritan, a pure savior of the victims of a failed experiment, the Planned Socialist State of India, he was trying to end their misery, the Pathar Maar, he was on a mission to wipe out poverty, or so I thought, sunk in my own poverty in the back of the taxi, slumped against upholstery stained a Bombay shade of brown, telling the driver to slow down as we drove past the women, and I saw, I swear I did, the face of a maid who looked aft er me when I was a small child, a dark woman who smiled sweetly when I hit her, and I knew it was her, washed up in the dead- end district where the women were graded, were priced and displayed in every street and gully and house, women from the far north, from the south, from all over, bought new and used, sold or given away, bartered, almost free, I knew it was her but I didn’t stop and the taxi slowed to a crawl behind a jeep with a printed sign, governament of india, and when the driver found the address I’d given him for Rashid’s he assumed I was going to the cages, the cheapest rooms on the street, where the women were five rupees and upwards, and he pointed to the houses with numbers printed on the window boxes and said, “Number houses better,” nodding at the streetwalkers and the women in the cages, “these girls dirty,” as I stepped out of the cab and into chaos because a buffalo cart had broken down and a crowd was quickly gathering to watch the animal kneel in the narrow road as the carter whipped it in sharp methodical bursts of fury, though otherwise he was calm, he didn’t curse or sweat as his whip hand rose and fell, rose and fell, slabs of ice packed in sawdust melting in orderly rows on the back of the cart, and everywhere the poor and deranged waited and watched, as I did before climbing the stairs to the first- floor address I’d been given, to stand at the doorway and take it in, a smell of molasses and sleep and illness, a woman tending the pipe, using a long needle to cook the opium, her hand moving as if she was knitting, a couple of smokers lying on pallets, an old man hunched over a stove, inhaling as the opium bubbled, everything in the room happening on the floor, sleeping mats and pillows folded or spread, a calendar on the wall with a photograph of a mosque— listen, stop there and light me again, or let me do it, yes, ah yes, now that’s it, lovely, such a sweet meditation, no, more than meditation, it’s the bliss that allows calm to settle on the spirit and renders velocity manageable, yes, lovely— and now, in the same city, though it’s a lifetime later and here we are, I and I, which isn’t said in the Rastafari way to indicate we, but to separate the two I machines, the man and the pipe, the who and the who, telling this story about a long- ago time, when I smoked a pyali and I was sick all day, my first time on Shuklaji Street, new to the street and the city, separated by my lack of knowingness, by the pace of human business on the sidewalks and shops, knowing I didn’t have the skills, my gait too slow, paying too much attention to the wrong things, because in my head I wasn’t all there and the partialness, the half- there distractedness, was apparent in my face, people looking at me and seeing jet lag, recognizing it as a spiritual deficiency, and I went into Rashid’s room, placed my head on a wooden pillow and stretched out, trying to get comfortable, realizing with some surprise that the old man who was nodding over the cook pot was speaking English, speaking to me in the language of a death- mad, religion- obsessed country of living saints, asking if I was Syrian Christian, because he’d noticed the Coptic cross around my neck and he knew Roman Catholics wouldn’t wear that kind of cross, and of course he was right, I was Syrian Christian, a Jacobite, if you want the subsect of the subsect— so good, this good smoke, the last smoke from the last pipe on the last night of the world— the old man, whose name was Bengali, saying, “Ah, in that case, perhaps you can answer a question that has been troubling me, I mean the particular way Christianity caught on in Kerala and how Kerala’s Hindus, instead of adjusting themselves to Christianity, adjusted Christianity to themselves, to the old caste divisions, and, this is my question, would Jesus have approved of caste- conscious Christianity when his entire project was the removal of it, a man who fraternized with the poor, with fishermen, lepers and prostitutes, the sick and dying, women, his pathology and compulsion to espouse the lowest of the low, his message being God’s unconditional love, whatever one’s social standing?” and what reply could I have made when he wasn’t expecting one, was already nodding as I watched the woman, watched Dimple, and something calmed me in the unhurried way she made the pipe, the way she dipped the cooking needle into a tiny brass pyali with a flat raised edge, the pyali the size of a thimble, filled to the brim with treacle, a liquid with the color and consistency of oil, and she was rolling the tip of the needle in the opium, then lifting it to the lamp where it sputtered and hardened, repeating the procedure until she had a lump the size and color of a walnut, which she mixed against the bowl until it was done, then tapped the needle against the pipe’s stem, indicating to me that my smoke was ready, it was, but the pipe was too long, I couldn’t manage the heaviness of it, and though I sucked when she held the bowl to the flame, the mouthpiece was too large, the taste too harsh, and when the pipe clogged she took it briskly away to apply the needle once more, saying in English, “Smoke, pull hard,” Rashid saying, “Watch Dimple, she’ll show you,” and she did, shaking the hair out of her eyes, expertly and elegantly fitting the pipe to her mouth, taking a long clean drag, the smoke seeming to disappear, so when she gave me the pipe I was very conscious that it had been in her mouth, and she said, “Pull deep and keep pulling, don’t stop, because if you stop, the opium will burn and there’s nothing you can do with burned opium but throw it away, so pull until you can’t pull anymore,” and I, in my ignorance, saying, “Do I take a single continuous drag?” “You can, but then you have to recycle it inside your lungs, better to take short pulls,” “How long should I hold it in?” “So many questions, it depends how much nasha you want, hold it as long as you like, but don’t put the whole pipe in your mouth, not polite,” and I said, “Sorry,” and quickly moved the pipe away and brought it back to my lips with care, fitting it carefully, taking my time, understanding that opium was all etiquette, a sense rhythm that centered on the mouth and the way you held the pipe in relation to your body, a lunar ebb and pull of smoke that filled first the lungs and then the veins, and when I looked up she was smiling and so was Bengali, and Rashid said, “Here people say you should introduce only your worst enemy to opium, maybe Dimple is your worst enemy,” and I was thinking maybe she isn’t, maybe I is, maybe the O is the I and I is unreliable, my memory like blotting paper, my full-of-holes, porous, shreddable nonmemory, remembering details from thirty years ago but this morning a blank, and if memory = pain = being human, I’m not human, I’m a pipe of O telling this story over the course of a single night, and all I’m doing, the other I, that is, I’m writing it down straight from the pipe’s mouth, the same pipe Dimple made the first time, but that story’s for later— okay, here we go, we’re coming to the best part now, the dreams, which aren’t dreams but conversations, visitations from absent friends, a raucous procession behind your closed eyelids, your awake and dreaming eyes, and sometimes a voice wakes you, your own voice talking to someone who isn’t there, because you’re alone, on your back, sailing the opiate sea, no, I’ll pass this time, I’m fi ne, oh yes, beautiful even— the same I who, when they put me in jail, noticed the cell wasn’t much smaller than the room I was living in at the time on the Upper East Side, when they caught me buying dope, stoned on downers, and the white cop pulled his gun and chased me down the alley and I saw the dead end and turned, reaching in my pocket to give him the baggies, and the cop didn’t shoot, for some reason he didn’t shoot, he put me in a van and took me to jail, where, as I say, the cell was the size of the room I was living in and I was happy enough to be there and alive, and later I was sent back to India and I found Bombay and opium, the drug and the city, the city of opium and the drug Bombay— okay, time now for a short one, the night’s almost over, a short one to keep the O boat sailing on its treacle tide, and this time all I’m going to do, I’m turning my head and inhaling, you do the rest— and ever since I’ve tried to separate the one from the other, or not, because now I’m giving in, I’m not separating but connecting, I’m giving in to the lovely stories, I’m lighting the bowl, one for me and one for me, I’m tasting it one last time, savoring the color and the bouquet, the nose of it, yes, like that, so good, and then I’m stopping, because it’s time now to subside into silence and let the other I speak. 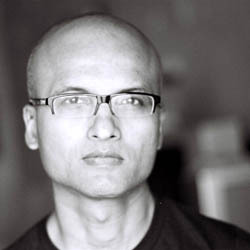 Jeet Thayil was born in Kerala, India, and educated in Hong Kong, New York and Bombay. His poetry collections include English and Apocalypso. He is the editor of Give the Sea Change and It Shall Change: Fifty-Six Indian Poets (Fulcrum) and Divided Time: India and the End of Diaspora (Routledge). His new book of poems These Errors are Correct is forthcoming from East West. He lives in Bangalore. 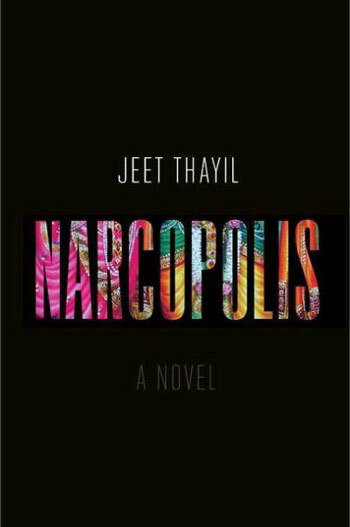 Adapted from Narcopolis, by Jeet Thayil. 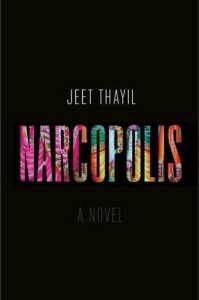 Copyright © 2012 by Jeet Thayil. With the permission of the publisher, Penguin Press HC.